Planet Forward Summit speakers share how to use storytelling to persuade an audience to rethink waste and eat plant-based. Marco Borges, the man behind Beyoncé’s plant-based eating challenge, knew that the interactive tool he created to quantify the environmental impact of a plant-based diet would not get enough media buzz on its own. But once he showed The Greenprint Project tool to Beyoncé, she suggested sharing it on Instagram with her more than 126 million followers and attaching a sweepstakes for one participant to win concert tickets for life for her and/or her husband Jay-Z’s shows. National media outlets picked up the story immediately, and Mr. Borges was invited to talk about the project on multiple broadcast networks. "The reality is that they were interested in the story because of how we wrapped the story,” Mr. Borges said. “It's not just the subject of the story, it's how you package the story…it is not just something you can create in a vacuum, it is something that you create with amazing people around you, but it has to be authentic." 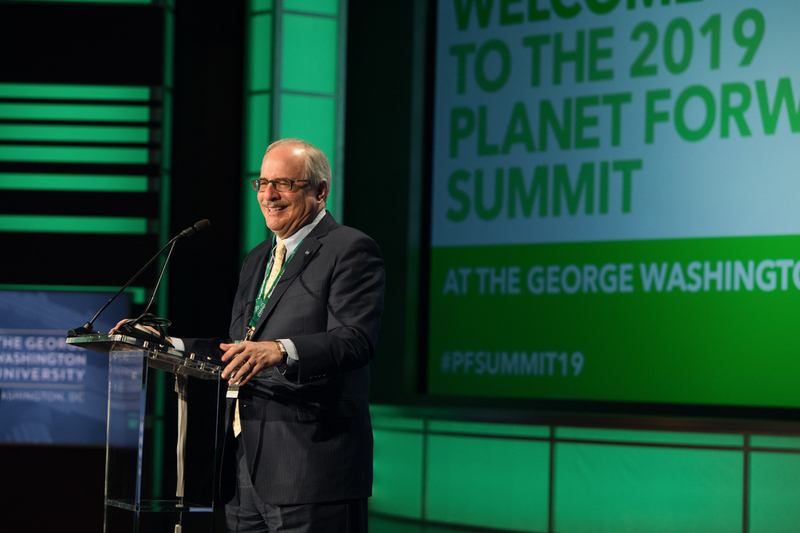 Mr. Borges, the New York Times bestselling author behind 22 Days Nutrition, talked about the storytelling aspect of this project during the Planet Forward Summit on Friday, hosted by the George Washington University School of Media and Public Affairs. SMPA Director Frank Sesno, who started the Planet Forward project 10 years ago, said the summit is about learning how to tell impactful stories. The annual summit, which began on Thursday in Jack Morton Auditorium, aims to amplify voices that use storytelling for environmental impact while bringing together sustainability storytellers from across the country. The summit featured keynotes and panel presentations from media correspondents who primarily report on environmental issues, as well as from those who use multimedia to tell sustainability stories through strategic media campaigns. GW President Thomas LeBlanc on Thursday said that combined strengths from a broad range of disciplines are critical to solving the most difficult environmental problems. Through teaching and research, campus initiatives and sustainable investments, he said, GW has long been committed to sustainability. GW President Thomas LeBlanc encouraged the students in the audience to keep telling environmental stories to help change the world. Mr. Borges’ advocacy for plant-based eating is based on his passion for promoting healthy lifestyles as well as his passion for the environment, he said. The environmental impact of the livestock industry cannot be ignored any longer, he added, and we all must work to make the world a better place for future generations. Within the first 48 hours of Beyoncé’s Instagram post, more than 200 million people pledged to eat more plant-based meals through The Greenprint Project’s sweepstakes. Mr. Borges said that with those pledges, participants could save more than 61 billion kg of carbon emissions and more than 874 billion gallons of water. Mr. Borges advocates going plant based even in small ways such as Meatless Mondays, plant-based breakfasts or swapping out a few meals a week with plant-based options, because even small steps can make a big impact on the environment. "The reality is that it's not about perfection, it's about progression,” Mr. Borges said. “It's about doing one small thing every single day to move in the right direction—to move in the direction of sustainability, to move in the direction of better health." TerraCycle CEO Tom Szaky also hopes to move the planet toward a more sustainable future. His company, sometimes referred to as the “Google of Garbage,” aims to eliminate waste and make the un-recyclable, recyclable. He recently partnered with companies such as Nestlé, Procter & Gamble and Unilever to create a “milkman model” for reusable home products—everything from orange juice to deodorant—called Loop. TerraCycle made its name by collecting items with no recycling solution, such as chewing gum, cigarette butts and dirty diapers, and processing these items for upcycling projects such as an outdoor playground made from aerosol containers. The international company works with corporations to fund these projects with their waste, and then promote those brands through engaging storytelling. But because recycling is an increasingly expensive process, Mr. Szaky has to convince these companies to spend their advertising dollars to recycle and upcycle their waste with TerraCycle instead. He said that sharing the story of a recycled product and environmental rescue efforts persuades the companies to do something different, and it draws consumers in to buying the product in the process. “People want purpose, especially in a news cycle that is so ridiculously negative," Mr. Szaky said. "Think about how to talk about what's good because it's overwhelmingly bad, and if you're swimming in overwhelming bad narrative, then you are paralyzed, and you don't do anything. The two-day national conference focused on clear and compelling storytelling methods that make an impact. Annual summit emphasizes how communicating narrative effectively can spark action on sustainability.